The most advanced Teeth and Body Poster available Internationally! A Full Size COLOR POSTER with illustrations(19"x27"). On SALE: Click "product details" below. 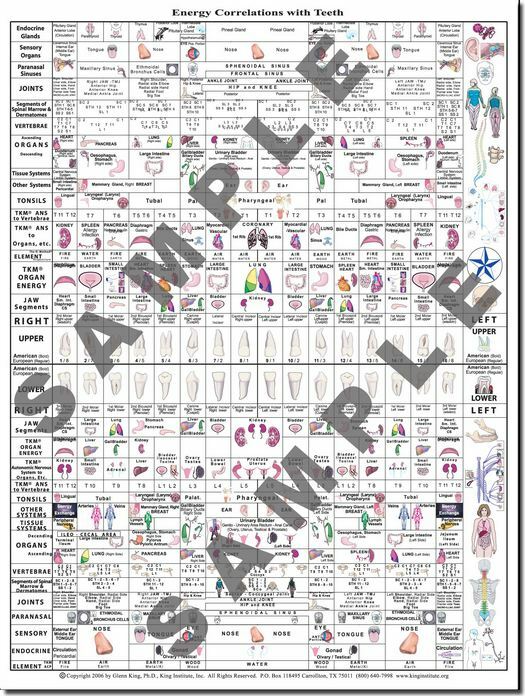 This full size poster provides organ, gland, vertebrae, senses, joints, tissue systems and many other system correlations to provide the most comprehensive tooth chart internationally. This information helps to understand health problems more easily. It involves TKM® relations, CNS, Acupuncture, ANS and other relations from a culmination of researchers around the world. There are several tooth charts available, but this is the most comprehensive known to exist. It provides a better understanding of physical, mental, emotional correlations to health issues. Highly recommend for anyone interested in health, especially if a student of any TKM® classes. It is a valuable addition to your wall and for your health. SALE: 50% off! Regular price $19.95, now only $9.98!